New for March 2018! 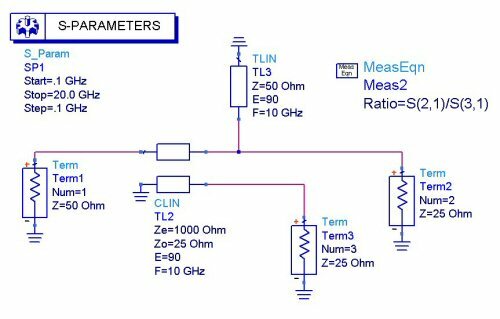 Baluns are used to convert balanced signals to unbalanced or single-ended signals. The word "balun" is a portmanteau. Planar means that the "windings" are mostly on the same metal layer, in a microstrip configuration (convenient for MMICs). Some RF crossovers are always needed, in the form of air-bridges and cross-unders which are normal processes in all GaAs and GaN foundries. Baluns are used in push-pull amplifiers and in wide-band antennas such as Peter Gibsson's Vivaldi notch antenna element. If you want to talk to a balun expert, start by finding your nearest antenna guy! Back to the subject of planar baluns. MMIC mixers were first offered starting some time in the 1980s. Some compromises in performance were made compared to hybrid mixers, but the new mixers were much, much smaller, owing to planar baluns using interleaved spiral inductors. The conversion loss of a MMIC DBM is usually 8dB, which implies that 2dB is lost in the RF balun. The loss in the LO balun (presumably 2dB also) translates to higher LO power being needed. In any case, MMIC mixers is where planar baluns first got a lot of study. If you buy a mixer from Analog (was Hittite), or CMDS, you will see planar baluns. 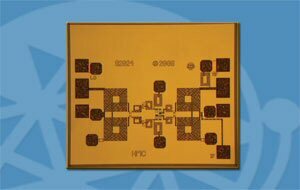 Let's look at a a 6-26 GHz MMIC mixer from a 2009 Hittite press release back in the day when MMIC companies proudly showed off their artwork. These days they are worried about competitors copying the work so published images are usually distorted and useless. On the left is the LO balun (a matched pair of spiral inductors), on the right is the RF balun. The IF signal is on the lower right and is tapped from the RF balun. If you want to learn about this mixer's performance, here is the data sheet. Here we have a video from Plextek RFI on how to design a planar balun, using Keysight's ADS electronic analysis software. In it, Andy Dearn (no relation to actor Bruce Dern, the most awesome spaceman of all time) talks about the Frlan, Rabjon and Marchand balun structures, settles on the Marchand, and predicts the performance of the RF and LO baluns for a double-balanced mixer. Primary and secondary windings are shown in detail. Loss of the baluns are reasonable, at ~1dB, and input match is better than 10dB over approximately 10-20 GHz. The IF port is tapped from the RF balun, and a low-pass shunt-C, series-L, shunt-C filter is added to increase isolation of RF and LO signals out the IF port. The ring diode is created from four FETs using the gate's Schottky diode response. The full mixer is then simulated, it shows flat conversion loss from 7 to 22 GHz, and useful response from 6 to 25 GHz. Note that "useful" response in a mixer is in the eye of the beholder... Typically, RF port impedance match is poor at band edges but you can always add a low value attenuator pad in front of it to quiet down any gain ripples due to standing waves between your LNA and mixer. Pretty much all you need to know about DMB MMIC mixer design is right here, thanks to Plextek RFI! E. Frlan, S. Meszaros, M. Cuhaci, and J. Wight, "Computer-aided design of square spiral transformers and inductors," in Proc. IEEE MTT-S, June, 1989. pp 661-664. G. G. Rabjohn, “Monolithic Microwave Transformers,” M.Eng. thesis, Carleton University, Ottawa, ON, Canada, Apr. 1991. John R. Long, "Monolithic Transformers for Silicon RF IC Design", IEEE Journal of Solid-State Circuits, Vol. 35, No. 9, Sept. 2000.